A new chapter for protectionism? Can the US dollar serve as a trade tool? At yesterday's ECB meeting, President Mario Draghi called Mnuchin out on his weak dollar comments - implicitly criticising Mnuchin for breaking an International Monetary and Financial Committee (IMFC) agreement that stated ‘we will not target our exchange rates for competitive purposes’. While President Trump has since said that he expects the dollar to get 'stronger and stronger', it will be hard for Washington to put the 'weak dollar' genie back in the bottle. This marks a new level of friction between the Trump Administration and international partners – friction that already exists at a foreign policy and trade level – but has now also broken out between the guardians of exchange rates. The next couple of weeks could be a watershed moment for world trade and protectionism – with President Trump's Davos (26 Jan) and, more importantly, State of the Union (30 Jan) speeches likely to set the tone for US trade policy over the coming year. Were 'America First' policies to quickly lead to a 'Sell America' sentiment in global markets, then we could well see EUR/USD moving beyond 1.30 - and USD/JPY down at 100 - by year-end. A protectionist Trump administration has always been one of the main threats to the US dollar - especially for an economy carrying twin deficits and therefore heavily reliant on good relations with foreign investors for their financing. But that threat has shifted to reality this week given President Trump’s decision to uphold recommendations from the International Trade Commission (ITC) and slap anti-dumping tariffs on imports of washing machines and solar panels. This was the first use of Section 201 anti-dumping tariffs since 2002. The ITC currently has close to 40 active investigations on anti-dumping complaints, suggesting plenty of scope to see more retaliatory tariffs from Washington this year. Welded stainless steel pipes from Korea and Taiwan could be next, according to the ITC’s website. Mnuchin’s comments have contributed to the dollar selling this week and raise questions as to whether the Trump administration's plan is to use the dollar as a trade tool. Typically, Republican administrations are worse for the dollar – especially during the second and third years of the four-year Presidential term. In practice, that sees Republican administrations shift from a ‘strong dollar policy’ embraced by the Democrats to a policy that FX rates should be freely determined by the markets. Softening a strong dollar policy is one thing, but actively talking down the dollar is quite another. There is some precedence here. A newly-elected President Clinton tried to prise open the Japanese auto-part market in 1993/94. His Treasury Secretary, Lloyd Bentsen, opined how a weaker dollar would help narrow the US trade deficit with Japan. That policy soon got out of hand, however. Not only the dollar but also US Treasuries and equities sold off and a ‘Sell America’ mentality was born. It took well over a year, much FX intervention, coordinated interest rate moves between the Fed and the BoJ and ultimately the birth of the strong dollar policy under a new Treasury Secretary (Robert Rubin) in April 1995 to stop the dollar rout. Such 'Sell America' signs have been sporadic in recent years. 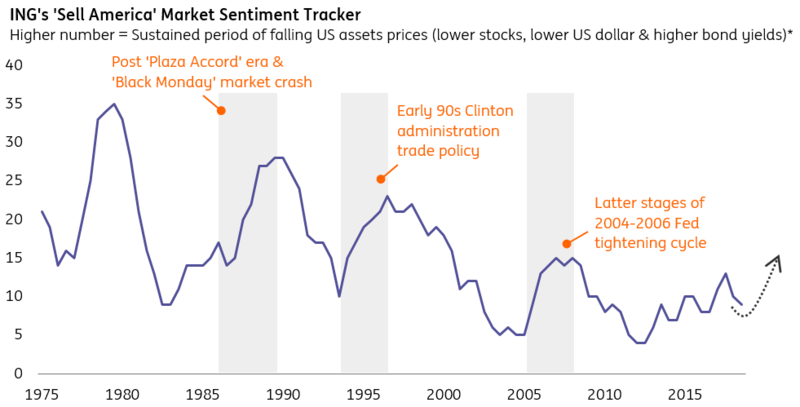 Our 'Sell America' Market Sentiment Tracker - which identifies sustained periods of a co-ordinated downturns in US assets (ie, lower stocks, higher bond yields and lower US dollar) - shows that we remain well below the degree of pessimism expressed during the early 90s Clinton administration. Looking ahead, we note that a stealth environment of 'Sell America' can exist as the Fed tightening cycle enters its latter stages - drawing parallels to the 2005-2006 market backdrop. This would be consistent with our outlook for gradually rising long-dated US Treasury yields - and strategically bearish US dollar - in 2018. However, for us to really get back to the 'Sell America' sentiment seen during periods in the 1980s and 1990s, we would need to see one of two things: (1) the Trump administration's 'America First' ideology leading to the implementation of more meaningful protectionist policies or (2) a structural shift in the stock-bond correlation (which for other reasons beyond this note looks unlikely in the current 'lowflation' world). The first factor is the real risk in the near-term - and the next couple of weeks could be a watershed moment for world trade and protectionism, with President Trump's Davos (26 Jan) and State of the Union (30 Jan) speeches likely to set the tone for US trade policy over the coming year. With investors wary of protectionism, it will be hard for Washington to put the weaker dollar genie back in the bottle. We are already targeting EUR/USD at 1.30 year-end (and 1.35 in 2019) on a benign dollar decline, with USD/JPY potentially moving to as low as 90 by end-2019 (base forecast currently 105). A malign decline - and the addition of a protectionist risk premium - may require us to cut our dollar forecasts further still.